A local Green Lanes family own the shops Lido and Brouhaha on Green Lanes N8. The family run hardware store Lido has been open on Green Lanes for thirty years. Brouhaha is a trendy bar with a stylish rooftop terrace. This has only been open for the past year. It is a symbol of the new more trendy Green Lanes, being managed by the two sons of the owner of Lido. In the centre of the piece an iconic Routemaster bus is passing through Green Lanes. 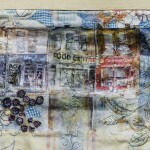 Close up digital fabric, embroidered versions of this piece are also available sized 63 x 63 cm. these have been hand embroidered to highlight different areas.